It's easy to think of stock as just another recipe. "Add this, this, and this to the pot, simmer for this long and you're done." And it's certainly possible to prepare a decent stock using this approach. 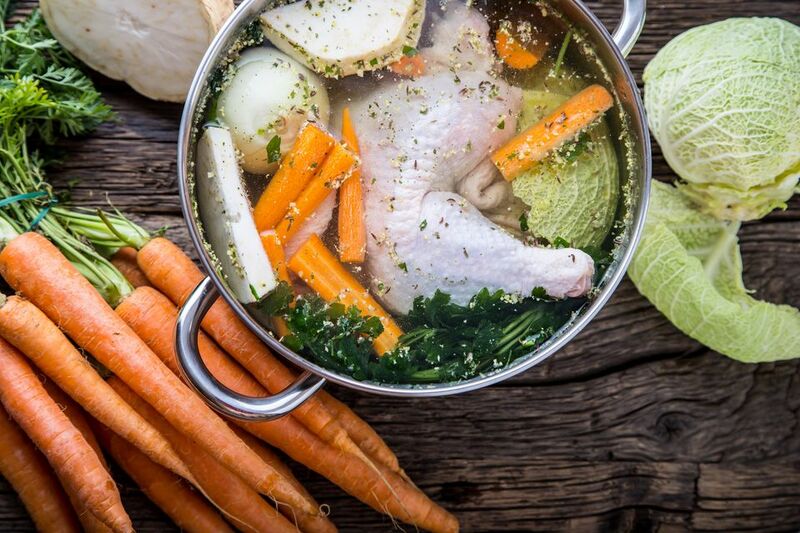 But given that stock is the basis for so many dishes, from sauces to soups and stews, it's important to understand the purpose of each ingredient and the properties each one brings to the stock. Some ingredients increase the body of the stock, while others help to clarify it. Some additions create more intense flavor, others add color. Stocks are divided into two categories: White stocks are used as the base for velouté sauce and various derivative sauces like allemande and suprême sauces. Brown stocks are used for making demi-glace and its derivatives, such as bordelaise and sauce Robert. Note that beef or veal bones can be used for either white or brown stocks: When making white stock, the bones are blanched first, or quickly boiled, then drained and rinsed, before simmering. For brown stock, the bones are roasted before simmering, and some sort of tomato product is usually added. The roasting and tomato product give the brown stock its darker color. Bones contain collagen, which when simmered forms gelatin. The more gelatin there is in the stock, the more body it will have. When chilled, a good stock should actually solidify. Certain proteins, most notably albumin, will only dissolve in cold water—and albumin helps clarify a stock. Therefore, starting a stock with cold water helps release the albumin, producing a clearer stock. Because much of the process of making stock comes down to removing impurities, it is best to use filtered water whenever possible. If you don't have a home water filtration system, an activated charcoal pitcher is fine. Tomato: Brown stocks use some sort of tomato product, usually tomato paste, which also adds color and flavor to the stock. Wine: White stock and chicken stock sometimes use white wine, and fish stock almost always does. One thing to remember is that acid reacts with aluminum cookware, so use a stainless steel stockpot for making stock. Sachet d'epices: A small cheesecloth sack of dried and fresh herbs and spices. Bouquet garni: A bundle of herbs and aromatics tied with cooking twine. Both the sachet and the bouquet garni are tied to a length of cooking twine and added to the stockpot to simmer; the other end of the twine can be tied to the handle of the stockpot, making the sachet or bouquet garni easy to retrieve. Because stock is often further reduced — like when making demi-glace, for instance — salting the stock would make the resulting demi-glace much too salty. It's better to make a habit of seasoning your sauces just before serving rather than salting your stock. Plastic zip-top bags: Fill the bags and lay them flat so you can stack them and save space in the freezer. These bags are also handy for labeling. Wide-mouthed glass jars or containers: Glass eliminates the worry about toxins in plastic, and you can thaw the stock right in the glass jar, loosely covered, in the microwave. Ice cube trays: These are useful when you need just a small portion of stock, such as for deglazing.